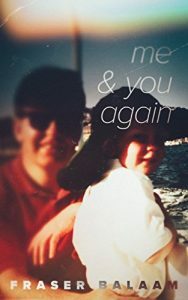 The latest in my recent attempt to clear my vast “to read” collection on my iPad’s Kindle collection is Me And You Again, by Fraser Balaam. I know Fraser in a sort of passing way – we chat on Twitter from time to time, we’ve exchanged the occasional email, and we know a few folk in common, but we’ve not (to my recollection) actually met. So if it wasn’t for that explanation (which doubles as a disclaimer), I doubt I’d know about Fraser’s book, which is therefore a relief because not only is it right up my street genre-wise but it is also a delightful piece of memoir meets travel writing. Fraser’s dad sadly died when he was a teenager. The premise of the book is Fraser’s desire to find out more about his dad, by following in his footsteps, meeting some of the folk he knew, and exploring his letters, past projects and pursuits. Although his father was not famous in the conventional sense he’d certainly lived an interesting – if tragically cut short – life. He had a passion for music, especially Cat Stevens, that manifested itself in an array of collectible paraphernalia, a book about the singer, and a fan site he created through which he made deep friendships. It is through the latter that many of the avenues into his father’s life appear for Fraser, and his travels take him to various parts of the UK, and even abroad to the USA and Russia. The book is understandably poignant, not just through Fraser’s own memories of his father and his attempt to find out more about him, but also, especially so, through the old friends of his father’s that he meets on his adventures. The book emphasises the fragility of life, the randomness of connections and the strong sense of identity that we find in those we know and are connected to. Fraser writes well about the deep stuff, but keeping an observant eye and neat quip regularly to hand to draw us more into the story. We get to know Fraser and what makes him tick as much as we do his father, and you can’t help feeling that both of them – together or not – would be tremendous company. You And Me Again is not an enormously long read, but makes up for it with occasionally beautiful turns of phrase and a poignant jump back in time to years that are not all that far back but feel an age away.